So, now we know that color temperature is an important attribute of color, and that seeing and painting those shifts will add quality to our paintings. But, where do we look for them? Over the many years that I studied with Ned Jacob, he rarely answered my questions directly. Usually, he would say enigmatic things like “know where the violet lives”. Catchy, huh? But, not helpful. So, I plan to tell you exactly where to look for color temperature changes. Color temperature in landscape painting is most often a product of the color of the light and/or surrounding local color. The light is either warm (directly affected by sunlight) or cool (directly affected by the cool sky color). Both of these things will occur in the same scene. So your job is to know where the light is warm and where it is cool. One simple thing to remember is “it’s warm in there”, meaning that the interiors of things and the undersides of things – under trees, interiors of foliage masses, cracks and crevices in rocks, and things like that will typically hold some warm reflected light. Here is a dramatic example of that. 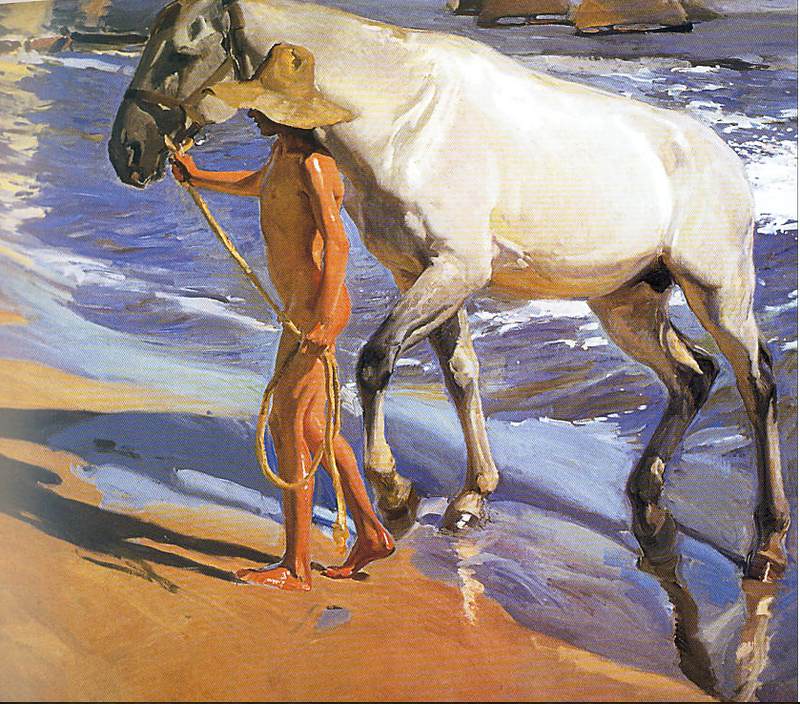 This painting by the Spanish impressionist Joaquin Sorolla (1863-1923) shows how the warm light of the sand is reflected up onto the belly and the inside of the leg of the white horse. The cool light of the sky cools the temperature of the boy’s chest in shadow, and also cools the color on the horse’s back in light. A masterful orchestration of color temperature! Click for larger view. 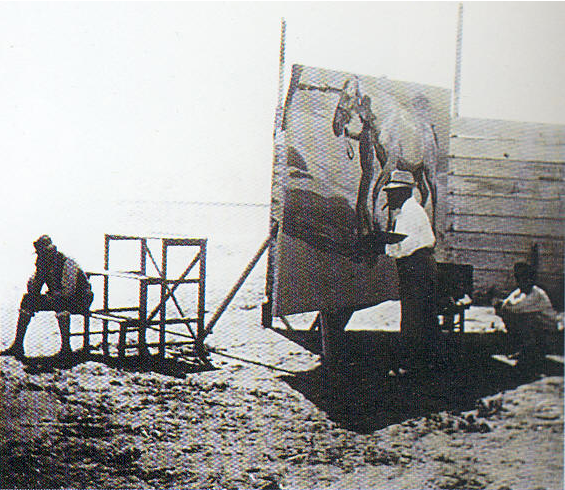 Just for fun, here is a photo of the man himself painting that huge canvas on a beach in Spain. But, we don’t need to have a big white horse in our painting to see and paint color temperature changes. 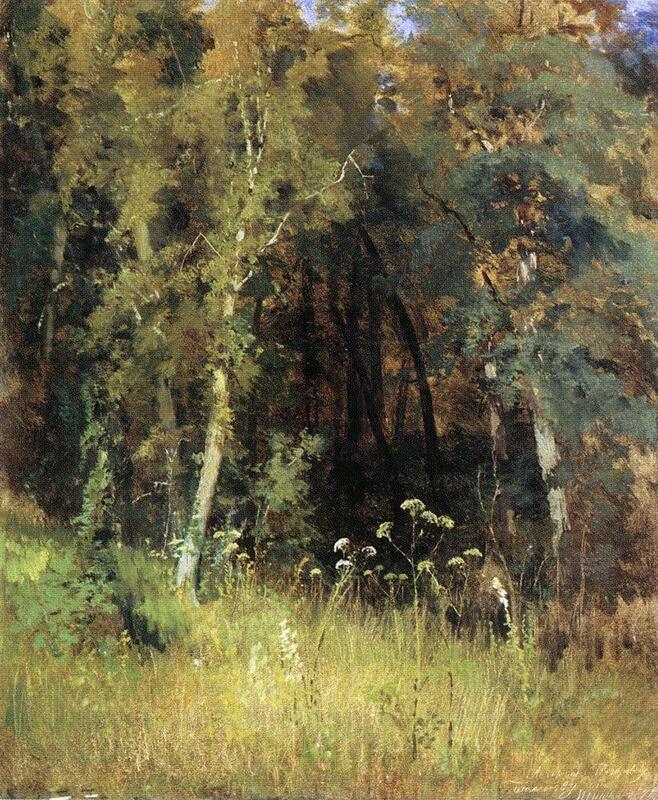 Here is a beautiful painting by Russian painter Isaac Levitan which also demonstrates these ideas, albeit with more subtlety. Click for larger view. Here the sun strikes the tree from the front left. The foliage in the upper areas of the tree is cooler, influenced by the cool light of the sky. The light struck areas are of course warm. But, so is the lower foliage and interior areas behind the tree, as a result of warm light bouncing up from the ground plane. 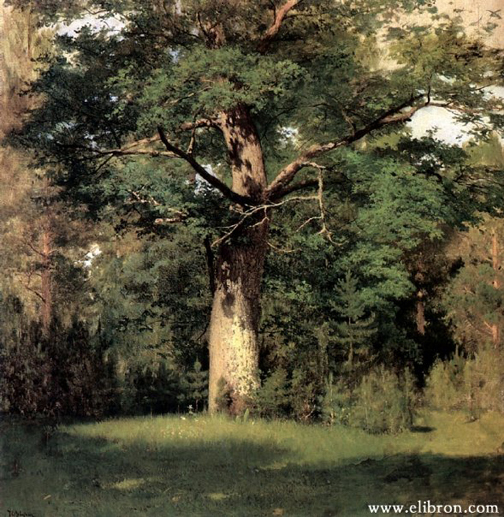 Here is another example from Ivan Shishkin, my other favorite Russian. The interior of this wood is warm! You might be tempted to paint that cooler, to make it go back, but you would be wrong. It would come charging toward you. But, with that nice warm color in there it recedes. The trees on the exterior of the woods are cooler, affected by the cool light of the sky, especially on the right side. Another place to look for temperature changes is in shadows. Form shadows tend to be warmer and cast shadows cooler. In a cast shadow you will find more warmth closer to the object casting the shadow and cooler as it moves away and is more affected by the cool light of the sky. 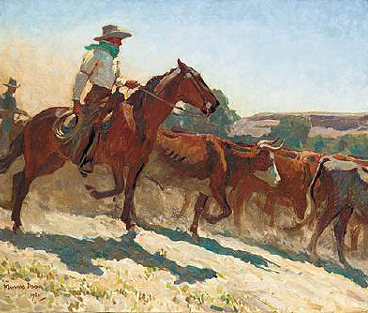 Here is an example by Maynard Dixon, iconic painter of the American West. Click for larger view. See that shadow on the ground cast by the horse? There is warm reflected light in the shadow from the horse and cool reflected light from the sky. So be on the lookout for places in the landscape that hold color temperature shifts. See them and paint them! P.S. Last call for our online class Practical Color Mixing for Landscape Painters I which starts this Friday February 27. Crack the secrets of value, hue, chroma and color temperature! Join us! Applications for Summer 2019 Mentorship Program being accepted until April 15, 2019. Registration for 2019 online classes is now open! Click on the Online Classes Menu for Information and registration. Welcome to Field Notes – the blog of The Landscape Atelier! Here you will find helpful posts about drawing and painting the landscape, reviews of books and exhibitions, some art history notes and useful information about the natural world. All images and text are copyright Deborah Paris 2015 and/or the respective owners. For use of all text or images in traditional print media or for any commercial use, please contact Deborah Paris for permission. For use on a non-commercial blog, website or Facebook, please ask permission and provide a link back.